and by the prepositions IN and OUT. I definitely still need to work on my production quality, not to mention my timing and delivery. But if there are ten minutes of your life that you could spend either watching paint dry or learning how to graft two knitted edges together invisibly, I highly recommend watching this video. If you do not shy away from grafting but need the security of a reference tool, you still qualify as a knitting hero in my book. That was me, before I had my Aha! moment. However, the truth is that grafting is a lot easier to “see” than it is to describe in words, and once you can see it, you can do it. Independently. Consistently. Flawlessly. And even in pattern! I am convinced that Kitchener’s problem (the stitch, I mean, not Mr. Kitchener himself) began with the fact that knitters got stuck in describing anything having to do with yarn, stitches and needles in knitting terms. Insert needle into first stitch on back needle as if to knit. Leave stitch on… But hey, people! When you are grafting, that thing in your working hand is a SEWING needle. And how does a sewing needle work? You poke the tip into a fabric, then bring the tip out of the fabric again. In, out. Two words. IN. OUT. The little section of thread left behind between those two holes is called a stitch. Let’s make that our third word: STITCH. 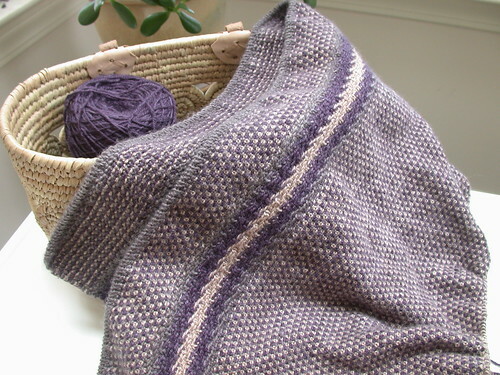 The essence of Kitchener Stitch is that you make a stitch into one edge to be joined, then cross over the gap and make a stitch into the other edge. You continue alternating in this fashion, drawing the edges together in the process. The only thing you need to clarify and visualize first is what counts as IN and what counts as OUT as you are making each STITCH. Today I am only going to talk about stockinette grafting. If you never graft in pattern your whole knitting life, you will be ~oh-kay~. But the thought of any otherwise competent knitter being afraid to graft in stockinette makes me very sad. And potentially leaves a lot of open sock toes. Hopefully you have come to understand that when you insert your knitting needle tip as if to knit, you are inserting it into the loop from the front (the surface closest to you) to the back (the surface away from you). When you insert your needle tip purlwise, you are inserting it from the back to the front. To work a basic Kitchener stitch, you go IN the last stitch you previously came out of on that side, and OUT the next stitch. (You pass through the loop of each knitting stitch twice to complete it. Once you have worked the second pass, you can move that loop off of your knitting needle.) The key to knowing which direction is IN and which is OUT comes from recognizing that the STITCH left behind is a purl bump. You want that purl bump to be left on the side of the knitted fabric that has all the other little purl bumps on it – the inside or wrong side. So insert your needle in one stitch and out the other, and before you pull it through, notice whether it is going to leave a stitch on the knit side or the purl side. Easy to correct if you got it wrong, but before long you will do it instinctively. The only further hitch is with the very first loop on each needle and the very last, because they don’t have a “partner” next to them. My solution is to pretend they do. Pretend there is an invisible loop before the first loop. Go IN the invisible loop and OUT the first real loop. At the end, pretend there is still another loop. Go IN the real loop and OUT the invisible loop. You’ll get it right every time. IN and OUT to make a stitch in the loops on the back needle. IN and OUT to make a stitch in the loops on the front needle. No need for a cheat sheet to remember that! Guess what I’ve been doing today! 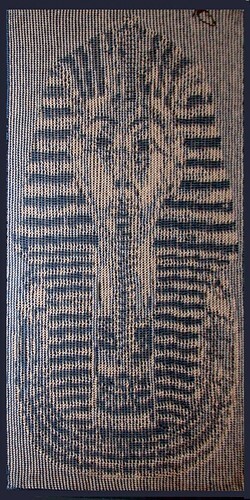 FINALLY getting around to dealing with a m0+# attack on the shadow-knit King Tut wallhanging I made as a gift awhile back. The infested creation was first mummy-wrapped in a plastic trash bag and quarantined in my unheated mud room for many weeks, which at this time of year is almost as good as a freezer. (I have learned that freezing does not actually kill moth eggs, at least not all of them, but it does at least make them go dormant to ward off further damage.) Before I go further into the subject of moth extermination, let me satisfy your curiosity about shadow knitting and my King Tut. Here he is in a Photoshopped portrait I just made while he is recovering from the steam treatment I gave him this morning. The editing was needed in order to apply perspective, or in this case remove perspective to make the image rectangular. Shadow knit images are only viewable from a vantage point that is low or to the side, making displaying photos tricky. This is because shadow knitting consists of narrow stripes of alternating colors, which are worked to create garter ridges where that color is to be visible, or stockinette valleys where that color is to be hidden. When viewed at a shallow angle, one sees the “mountaintops” of the garter ridges and not the “valleys” of the contrasting color. It is fairly easy to do and straightforward to add simple shapes and rippling color effects to a project. But hi-res images on a large scale, like this? Yes, it’s as crazy-making to knit as it sounds, especially because the step which determines whether a ridge or a valley is created is performed on the WRONG side of the piece, where you can’t see the image emerging at any angle. Which – if you know me – means you will understand why I just HAD to knit it. But even if you don’t know me you will understand why I wasn’t particularly thrilled when it started getting moth-eaten. As soon as I can dig up the remainders of the yarn I used (a feat of archaeology in itself! ), I will repair the little holes and he will be ready to return to his place of honor. As I am writing this, my dining room smells like wet sheep. I’ve been pleasantly puttering on this bright, brisk day, and turned my attention to my neglected pile of knitted things. Some were sweaters and socks in need of a wash. Others were recently completed projects — Christmas gifts, mostly — that I have been turning out one after the other without stopping to block them. The treatment for each was the same — a lazy soak in a basin of tepid water with a gentle wool wash; a rinse; a squeeze; and then to be laid out on beach towels, rolled up jelly-roll fashion and gently walked on to remove excess water. I’m sure there are many among you who wrinkled up their noses when I mentioned the smell of wet sheep (and some who do so at the mention of blocking one’s knitting). But I have learned the magic transforming effect of blocking. It evens out stitches and sets them, so that a project falls and drapes as it should and holds the correct size and shape. It makes a lumpy web of knitted lace grow and bloom to its full beauty. I urge you not to skimp on this step, not only because it’s good for your knitting, but because — if the way I’m feeling now is any indication — it might also be good for your soul. 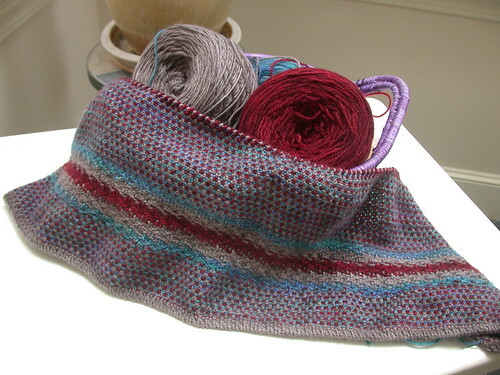 Much has been written recently about the many ways that knitting can enhance well-being. As I took my damp mounds and methodically smoothed them out on my blocking board, stretching and pinning or patting and straightening as needed, I realized that even the blocking step of the knitting process can have this same beneficial meditative quality. Inhaling the familiar wet sheep aroma as I worked, I realized that I felt contented. I’ve never thought about it before, but I suppose I have come to associate that scent with a sense of satisfaction and accomplishment. It makes sense. The blocking process is yet another opportunity to experience the colors and textures of fiber, to slow down and reflect, and also to show a healthy respect and appreciation for myself by fussing over the things that I put so much of myself into making. I am always drawn to return again and again to my drying projects, smoothing and adjusting until total dryness allows no further refinement. I have often told the family members who watch me with amusement that petting is an important part of the knitting process. Or maybe I just can’t resist the smell of wet sheep! It’s a lovely knit, in process and in product – as long as you are not too goal oriented. The Blue Moon Fiber Arts Blue Faced Leicester (BFL) Sport yarn is soft and ever so slightly fuzzy, light and warm at the same time. Except in my choice of colors (to suit the recipients), I actually deviated little from the pattern. The pattern is worked in rows the long way, starting with a tubular cast on founded on Judy’s Magic Cast On. Brilliant! Nothing to change there. But I did decide to start at the edge opposite the recommended starting place, for absolutely no reason other than that it would get me to the “interesting” part, the contrasting stripe, toward the beginning of my project rather than at the end. It just seemed more fun that way, and it would let me fully evaluate my color choices earlier in the process, in case I didn’t like them. The other change I made was to work a truly matching tubular bind off at the other edge, whereas the pattern instructs you to work in 1×1 rib for a few rows before grafting off the stitches. I assume this was simply for ease of working, but since either way I would need to work the stitches onto two separate needles, and either way I would need to Kitchener a bazillion and a half stitches, it seemed hardly any additional work to divide the stitches onto two needles after only one row of ribbing and work a couple of stockinette rounds before grafting off. I think the most important thing I DIDN’T change was the recommended needle size. This is one project where swatching and blocking the swatch (or in my case at least imagining I did) will pay off, because it changes dramatically. My project just off the needles measured 24″ x 58″. Blocked it came in at 20″ x 84″, the length of my blocking board and pretty much what it was supposed to end up at. To accomplish this, once I made sure that my stitch gauge would stretch the correct amount on blocking, I judged my progress by the number of rows worked rather than measuring. 17 rows (yes, 17 rows!) = 1 inch of blocked width. I may turn my attention to other things for awhile before I return to the second Vancouver, but I will return, no fear!